Premiering on Friday, September 12 at 9 p.m. ET is the all-new series from Destination America, "Alaska Monsters." Check out all the details below from the announcement and let us know if you'll be tuning in for some creature goodness. Click here to watch a sneak peek of the series. Within the Last Frontier lies a region known as the Alaska Triangle, spanning 200,000 unforgiving square miles where more people go missing per capita than anywhere else on earth. Treacherous terrain and unforgiving natural elements have stopped many in their tracks, but some Alaskans hold onto the idea that mysterious monsters snatched them up. Unidentified crypto-creatures wander the state covered by millions of acres of dense wilderness and are known to lift and reposition trees with ease, create seismic activity with their minds, and even decapitate humans with one bite. 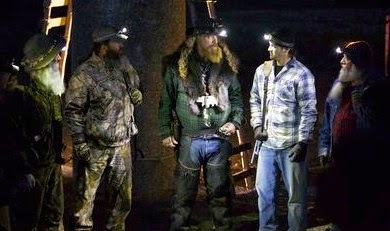 Destination America’s new series "Alaska Monsters" travels with a team of native outdoorsmen, who call themselves the Midnight Sons, as they investigate the harsh Alaskan forest in a quest to uncover proof of frightening monsters thought to be living there. "Alaska Monsters" series premieres Friday, September 12 at 9/8c on Destination America. In "Alaska Monsters," the team hunts and traps with the latest 21st-century technologies and investigation tools to shed light on elusive beings from the Saberwolf and the Otterman to the Northern Giant. Follow as this courageous and entertaining group attempts to trap these infamous Alaskan creatures. An Alaska based Monster Tracking team heads to Central Alaska to investigate an aggressive Bigfoot who has the locals on edge. Using a drone, they uncover shocking evidence and one of the team members finds himself face to face with an 800-pound beast.